Thank you to all who have made our Christmas services go so well; musicians and readers, servers and sidespeople, and many others. Here is the story I told at our morning service on Christmas Day in place of a sermon. And below are some special prayers and thoughts for Christmastide, some old and some new, to help you reflect on God's gift of love. May we all have a peaceful and blessed Christmastide. Gabriel with a group of experts. even less did he extend long term loans. and suffering with us he became our joy. The Creator of the world! But just on a piece of this earth. God’s Son became human, so that human beings might have their home in God. A beautiful dawn this morning over the snowy fields next door, but as we all know, "Red sky in the morning, shepherds' warning!" Snow is forecast for this weekend and the week leading up to Christmas Day. My plan is for services to go ahead as advertised, even if we have to improvise and simplify a bit! However, PLEASE do not take any risks to get to church if conditions are dangerous, and be aware that the roads and pavements leading up to the church are usually ungritted and often slippery. 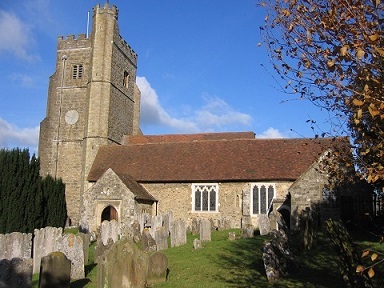 We will do our best to keep the church path itself free from snow and ice. If you are taking part in a service and cannot safely get here, please do not make heroic efforts to do so. Just let me know if you can, by phone or email, that you will not be coming. Above all, stay safe and remember that God is with you where you are! 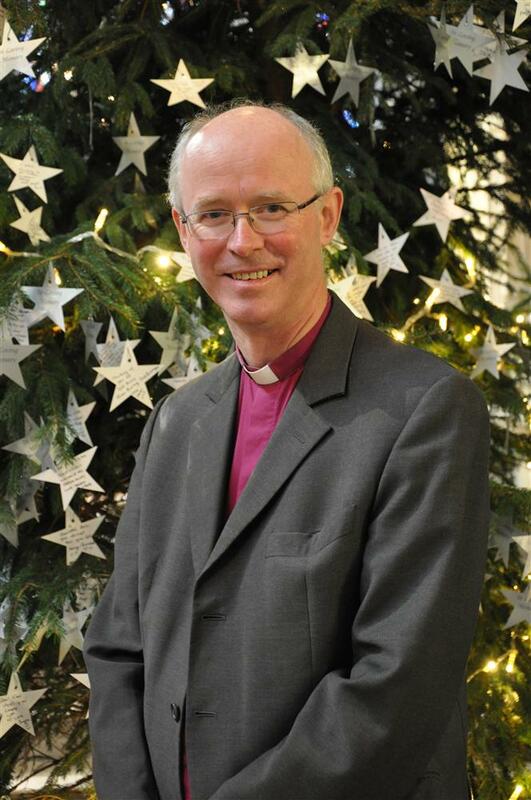 Bishop James Langstaff was welcomed as the new Bishop of Rochester on Saturday Dec 11th. I have pasted a copy of the sermon he preached at his installation below. He speaks about the overflowing generosity of God, and hopes that this Diocese will be a place where that generosity is a hallmark of our life together. Amen, Bishop, amen! Some other coverage of Bishop James' inauguration can be found in the links below: Rosemary Clary and Stephen Snelling represented Seal at this service, and I am sure they will be happy to tell you about it if you want to know more. While some may say that, ‘The best things in life are free’, others will have it that, ‘There’s no such thing as a free lunch’. Well today there is a free lunch – it’s under your seat and, just in case you’re tempted to tuck in at some point over the next few minutes, we do have cameras all over the building! Jesus made something of a habit of giving free lunches. John’s gospel records one such occasion as we have just heard; Mark and Matthew give us two. And John, as well as giving us a free lunch story, gives us also a free wine story – that of the wedding at Cana where, as the wine provided by the host runs out, Jesus turns water into wine of the very best quality. I did at one point wonder whether we might do that today as well, but wisdom overcame enthusiasm – and of course a number of you have to drive home afterwards. In this feeding miracle Jesus, not content with providing enough, provides more than enough – twelve baskets more than enough. Wasteful, some may think, but for John especially no detail is without its significance and here in these leftovers is the sign of God’s overflowing provision, God’s abundant generosity. At Cana too, the wine-diminished day is saved not with a few bottles of supermarket plonk, but with about 150 gallons of the best quality Burgundy (or whatever the Galilean equivalent might have been). There is a wonderful extravagance at the heart of God; an extravagance of what Christians call ‘grace’. Grace is God’s love, God’s favour, God’s acceptance, God’s generosity, poured out on humankind without condition. A reservoir that never runs dry, a sea with no shore – no end, an ocean that ever rolls. It is given without condition, because of course we could anyway never hope to fulfil any condition. This is not something we can earn, or achieve by our own efforts whether of hard work, academic success, worldly wealth or even religious devotion. This is 100% gift, as with the loaves and the wine, and it is free: freely given for us to receive. This generosity of God is the fulfilment of what is spoken of in the prophecy of Isaiah in deliberately paradoxical language: ‘you that have no money, come, buy and eat!’ But if I have no money, how can I buy? Precisely the point: even if we had all the money in the world, we could not buy the riches of God’s loving provision for us – but still we may, as it were, buy and so we receive. ‘Come, buy wine and milk without money and without price.’ As the prophet points out, we spend an awful lot of energy and indeed money striving after things which don’t really satisfy – ‘food that goes off’, as Jesus puts it elsewhere – but God is offering us something that really will nourish: good food to eat and rich fare on which to delight ourselves. And it comes to us as total gift. It doesn’t make sense in terms of the way things normally work but, as the passage tells us later, God’s ways are not our ways – in today’s language we might say that God is counterintuitive. The overflowing love of God; the inexhaustible riches of God; the inexplicable graciousness of God; the abundant generosity of God. A God who never tires of reaching out in love to us and to all humanity to welcome us to himself that we might live in his ways. A word perhaps for this day, for our times and for this season. For today, because today you have generously come together to welcome me; and in that welcome I recognise and am pleased to receive something of the generosity of God. Lots of people, including many here today, have sent kind greetings and words of welcome; some indeed have come many thousands of miles across the world and it is very good to have you here today from our partner dioceses. It is good (if also a little daunting) to sense the spirit of expectancy in those greetings and this welcome. That mutual and, I hope, generous welcoming of me by you and you by me will continue beyond today as I begin to know you and be known by you. Over the coming weeks and months you will find me popping up all over the place as I visit each deanery and try to take other opportunities to build a sense of relatedness between us. I’m looking forward to being in two parishes tomorrow, at the Bishop of Rochester Academy on Wednesday and at Rochester Prison on Thursday. And as you get to know me, my foibles and weaknesses, you will, I am sure, have plenty of opportunity to develop your gracious generosity in forgiving my failings. But perhaps in other ways too we will, in our dealings with each other, mine more deeply from that rich vein of God’s generosity. And I would wish to see that same spirit spread more widely within our church and churches – and my apologies to those of you not from the Christian community, if I speak for a moment to those who are. I do despair sometimes when I see and hear the ways in which Christians act and speak in relation to each other. Language used and attitudes displayed can be anything but Christian. The lack of simple graciousness and generosity can be shocking, not least to those not part of our churches. ‘See how these Christians love one another’ is sadly sometimes true only when said ironically. These are of course times of particular tension within the Church of England and the Anglican family more widely. And it is of course precisely because these are in a sense family disputes that there is sometimes such strength of feeling expressed – families are remarkably adept at falling out with each other in dramatic and public ways. But it’s not just - or indeed mainly - those high-profile, media-delighting disputes that I have in mind. I’m thinking also of the fallings out within congregations, the suspicions between congregations, the tensions within dioceses over money, sharing resources and the like. And I ask myself how the fabric of our being together within the church may more colourfully be shot through with the silken thread of God’s generosity and loving welcome. How we speak with, to and about one another should surely be with generosity of spirit. How we support one another and share our gifts should surely reflect that cheerful giving of which the apostle Paul writes to the Corinthians – the attitude which brings about a bountiful harvest of blessing in abundance. Freely you have received – freely give. A word for this day and also for our times. We hear much of tightening belts and tough decisions; we know of cuts coming in many services and spending streams. Businesses, charities, voluntary groups and private individuals face real challenges, tight credit, lack of sponsorship, falling off of income. How do we react? A temptation is to pull up the drawbridge, turn in on ourselves as individuals and as a nation and try to protect our own well-being. ‘Charity begins at home’, we may tell ourselves and now is the time to look after our own. But doing that - closing our hands as it were and holding ourselves tightly to ourselves – that actually ends up diminishing our own lives, making us less than we ought to be. Centuries ago, the people of Jerusalem had to learn as they went into exile in the strange land of Babylon – by whose waters they wept – that their well-being lay in seeking the well-being of those around them in the place where they were. And in these times there is a challenge to us to look beyond ourselves and our own needs, to open our hands, to work and to pray for that Big Society which the church has been working for over rather more than a couple of years; to be ready to give of ourselves generously for the sake of others. In my last diocese we had a link with Papua New Guinea, one of the poorest and least developed countries on earth. There I have had the privilege of meeting people who, in our terms, have almost nothing but who generously welcomed me and shared with me the little that they have. It is often those who have least who show us how to be generous. So how in these times will we open our hands and generously seek the good of all those among whom we live? A word for this day, for our times and for this season. In these days of Advent we prepare to celebrate God’s gift of gifts. For Christians the fullest possible expression of God’s generosity: the giving by God of his very self, the essence of his being, out of love for the world that the world may have life in abundance. The birth of the infant of Bethlehem, Jesus. It may or may not be that there are those intent on squeezing the meaning out of Christmas. If there are such people, it is certainly not our companions of other faith traditions, some of whom are most welcome guests here today. Those who are the followers of such faiths would no more extinguish Christmas than I would abolish Eid-al-Fitr, Hannukah, Diwali or Vaisakhi. What is the case is that in these coming days this building will be full to overflowing. And in churches across this diocese, through music, reading, prayer, poem, proclamation and invitation, the giving of that most wondrous gift will be celebrated afresh. Our generous God comes among us, is made one with us – and thanks be to God for that inexpressible gift. Remember the twelve baskets of leftovers and be inspired afresh with the extravagant generosity of God. Dioceses sometimes come up with strap-lines to describe themselves and their aspirations: we could do worse than being ‘The Diocese of Rochester: a generous people’ – just so long as it is true. A project for the New Year? A big thank you to all who helped make yesterday's grand Village Christmas event so successful (including the PCSO Sue Harwood, and a couple of our local firefighters who helped marshall the procession of children in costume and the donkey from the school up the dark and icy road to the Five Bells Pub !There should be pictures of the nativity scene in the Sevenoaks Chronicle soon , with Landlord John entering into the spirit of things with his Innkeeper's costume, and a wonderful "stable" complete with hay and assorted animals. In the meantime, here are a couple of pictures from inside the church. As well as the stalls there was also some activity on offer for the children, and a well used Quiet Area in the candlelit Lady Chapel for prayer. A great number of people, coordinated by the Know Your Neighbours group, were involved in organising this event - from the school, the pub, the church and other groups, with Marion Gilchrist holding it all together somehow. Thanks to Dan Clews, also, for providing entertainment in the church hall, and John Miah for his wonderful Tandoori Nights cooking - delicious as ever. Thank you to everyone for a night to remember, and I hope you have a quiet day today to recover! Crisis collection - thank you! Thanks to Anna Linley for the photo! 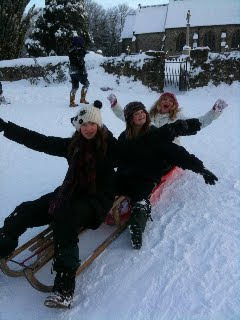 Thank you to all those sledgers who dropped into church for hot drinks last week. Your donations to Crisis added up to £73.86, which I have sent to them today. This means that we have provided for three people to be accommodated at one of their centres this Christmas. You can find out more about their work here. A few pictures of the activity in and around Seal Church this afternoon. Much fun was had by children (and their parents) in the snow, and the chance to warm up in the church with a hot chocolate seems to have been appreciated. And yes, you can see me pulling a sledge back up the hill in the last but one photo - someone insisted on me having a go, so I didn't miss out on the fun (!?) Mercifully the picture of me going downhill (gingerly) didn't come out so well! I have bowed to the inevitable and cancelled Breathing Space Holy Communion tonight. While I could have got there, I didn't want anyone else to be even vaguely tempted to try, since negotiating icy roads and pavements, with steps and other obstacles now buried under a thick lager of snow seems like an invitation to disaster. The short address I would have given, the first in a series entitled "Wait for the Lord" will be posted on the sermon blog - see link to the right - later today. The church will be open again today, with the makings of hot drinks for sledgers (and others), as soon as Philip and I have dug our way out of the house and up to the church door! I took the photos that follow as I cleared and salted the church path this morning - there was a foot of snow in some places, and it was blowing into drifts, so I thought I'd better at least try to keep on top of the snow shovelling, or we won't be able to get in at all ! I had a couple of cold looking teenagers in the church very gratefully making use of this even before I had finished setting up. I will try to keep this going over the next couple of days if the snow persists.